Celine and I don’t normally grill that much. While we both prefer burgers and chicken grilled, it can be a pain to stand over a hot grill trying to cook everything evenly. Also, I hate being enveloped in smoke after there is an inevitable flare-up. But, dare I say that my grilling skills are improving? 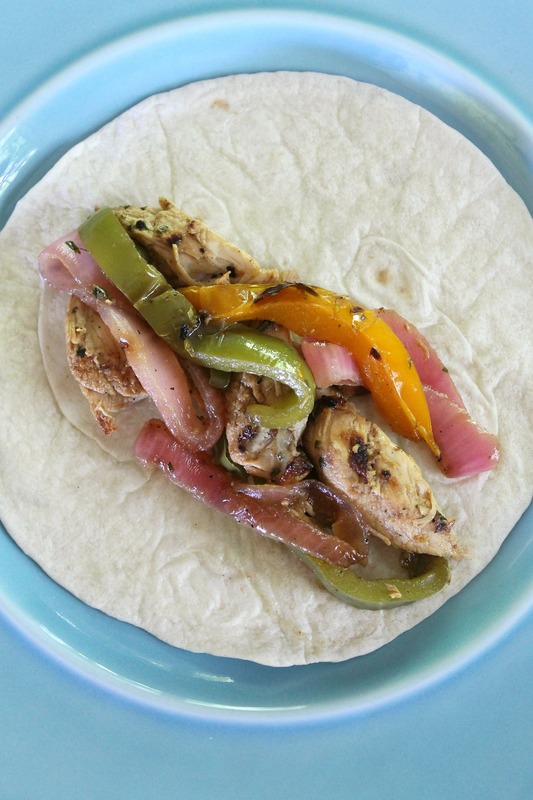 We made these chicken fajitas a couple of weeks ago, and they turned out perfectly! The marinade is awesome- it has jalapenos, cilantro, and lime juice, so you know it will be good. Before marinating the chicken, you set aside some of the marinade to toss the chicken slices and vegetables in after they’re grilled. I love this step because it brightens up the flavor of the fajitas- the bold flavor of marinades sometimes is cooked off a bit by the time the food is done, so this is a genius way to retain the great flavor of the marinade. So, whatever you do, please make these fajitas! They’re the best I’ve ever eaten, and I guarantee that you will love them too! 1½ lbs. chicken breast (about 2-3), butterflied. Or, use 1 1/2 lbs. of chicken tenders. In a small bowl, whisk together the lime juice, 4 tablespoons of the vegetable oil, garlic, Worcestershire sauce, brown sugar, jalapeño, cilantro, salt and pepper. Remove 1/4 cup of the marinade and set aside. Place the chicken into a gallon-sized Ziploc bag. Pour in the marinade, seal the bag, and shake it to evenly coat the chicken with marinade. Place the chicken in the refrigerator for 15 minutes. Meanwhile, brush both sides of the onion rounds and peppers with the remaining 2 tablespoons vegetable oil. Season with salt and pepper. Turn on your grill; high on one side, and medium-low on the other. Remove the chicken from the marinade and place on the hotter side of the grill (you can get rid of the leftover marinade). Put the peppers and onion rounds on the cooler side of the grill. Cook the chicken for about 3-4 minutes on one side, or until well browned. Flip the chicken and continue to grill until it is 160˚ F when an instant read thermometer is inserted into the center. Grill the vegetables for about 8-12 minutes, or until they are charred in places and somewhat tender. Turn at least once halfway through. Remove the chicken and vegetables from the grill and transfer to a cutting board. Separate the onion rings and place into a large bowl. Slice the bell peppers into 1/4-inch-thick strips and add to the bowl with the onions. Stir in 2 tablespoons of the reserved (unused) marinade. Slice the chicken into 1/4-inch slices and toss with the other 2 tablespoons of reserved marinade in another bowl. Serve the chicken and vegetables inside the warmed tortillas and enjoy!